It’s December 1st, and on November 23 I finished my third NaNoWriMo after 2010 and 2012. It is also the third time I’ve managed to write 50,000 words. I might have finished the word goal but I’m not finished with the book yet. I think it might need another 10-20K words. For this NaNo, I was writing the sequel to my 2010 project, the Coffee Legacy (Wiener Blut 1). 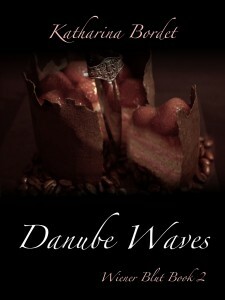 It is called Danube Waves and revolves around… cake! 🙂 Yes I am serious. That’s how the idea started. One cake per chapter instead of coffee. Not to worry, there is still a lot of coffee in the books and even more was consumed writing it. I hope I can finish the first draft of the novel by the end of the year but I also promised Mick to edit Some other Scotland, which he has finished during this NaNo. He’ll go on to writing his 2010 NaNo book which has yet to be finished. Once he has done that, he will go on to edit Danube Waves. I hope I’m quicker writing than he edits, but I have a suspicion I might be. So what else is next? Working on more Every Photo Tells… stories and on the 2nd edition of our guidebook Christmas Markets in Vienna, to add more markets and more photos. Once the edits of Danube Waves are done it’ll go out to the beta readers and I will start working on the audio book version. I was hesitant about it at first, mainly because I didn’t want to re-cast the people who appear again, but since I managed to convince the most important recurring voices, I’m happy to do a full cast version of it as well.